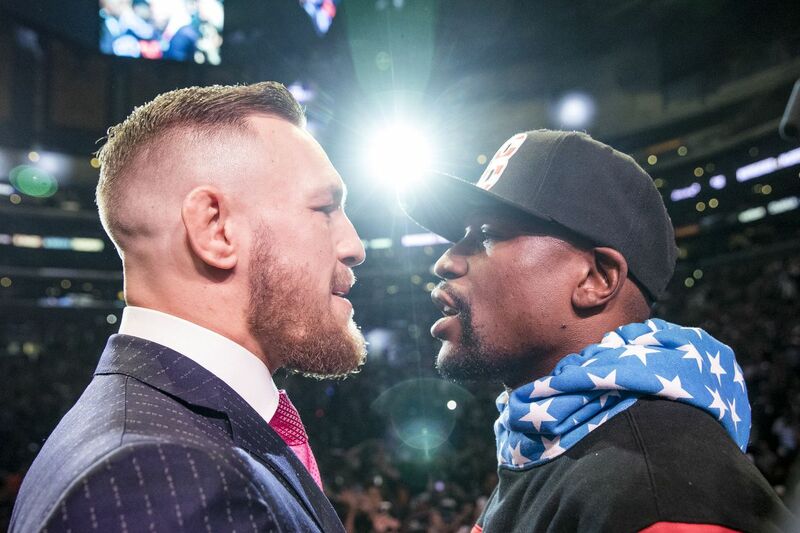 By David Berry: The combat sports world is buzzing this week as the Floyd Mayweather (49-0, 26KO) and Conor McGregor (pro debut) press tour reaches its midpoint. After stops in Los Angeles and Toronto, the duo is making headlines for the same reasons the Kardashians do - they're outlandish, they're in-your-face, and they're must-see entertainment. Entertainment is the key word there. Mayweather and McGregor make for fascinating showmen, and both are delivering an unending stream of "can you believe he said that?" quotes that the media and general public are eating up. But this is theater masquerading as a boxing match. Make no mistake, nobody - perhaps McGregor included - believes that McGregor will be competitive when the bell rings on August 26 at the T-Mobile Arena in Las Vegas. That's not a knock on McGregor. Any fighter making their pro debut in a boxing ring against arguably the greatest fighter of his generation would face the same doubts. And as such, anyone looking to plunk down $99.99 for the HD version of the pay-per-view and expecting a war or a competitive fight will be sorely disappointed. If an evenly-matched, can't-miss fight is what you'd rather plunk down your hard-earned dollars on instead, save them for September 16, when Mexican megastar and Ring Magazine middleweight champion, Saul "Canelo" Alvarez (49-1-1, 34KO), takes on Gennady Golovkin (37-0, 33KO), holder of the WBC, WBA, IBF and IBO middleweight titles on HBO PPV. Plus, you'll save $30; the fight will be $69.99 for the HD version. “This is going to be a very tough fight against Golovkin," said Canelo at the fight's Los Angeles press conference last month. "There are fights that are difficult, and this is one of them. I’m going to prepare like I always do at 100 percent." Fans had reason to doubt this fight would take place at all. Concerns swirled around Canelo's interest in a fight with Golovkin as far back as November 2015, when Alvarez unseated Miguel Cotto as the lineal middleweight champion of the world via unanimous decision. Shortly after the fight, when negotiations with Golovkin, his then-mandatory challenger, hit a wall, Canelo relinquished his belts. To a blood-thirsty public, it screamed fear. Canelo answered those critics head-on. “A lot of you said this fight would never be made," he said. "I’m happy we are giving the fans the fight they wanted and demanded on September 16 as that is a great motivation to me." The timing for a fight of this magnitude, for once, appears to be perfect. Golovkin, while unbeaten, looked ordinary in the eyes of many when he fought his way to a close unanimous decision win over Daniel Jacobs in his last outing in March. Canelo, for his part, appears to be improving in every fight, and looked as strong as ever in his 164.5 pound bout with Julio Cesar Chavez Jr. in May. Onlookers see it as a sign that Golovkin may have already seen his peak, and that Canelo hasn't yet reached his. The betting odds seem to support the notion that this is a dead-even battle. Bovada has Golovkin as a slight favorite at -160, with Canelo a narrow underdog at +130. Experts see it the same way. Boxing legend, Sugar Ray Leonard, said "I see this as being very even, 50-50 and the fighter who will win will be the one that manages to impose his fight plan. It's the kind of fighter where the mental aspect will be decisive, even more than the physical one." It's the ultimate contrast of ring styles, in a way that Mayweather vs. McGregor can only be while in front of a microphone. Golovkin is the seek-and-destroy puncher, who jabs his way in to a hybrid attack that often sees him go to his opponents' body with vicious abandon. On the flip side, Canelo is a fast, heavy-handed combination puncher with underrated and consistently improving defense. Golovkin has theoretical advantages if they trade punches. Canelo has theoretical advantages if he can counterpunch in combinations when Golovkin misses. And there are stylistic layers in each fighter that could provide any number of outcomes beyond those just listed, but none figure to lead to a boring contest. “Canelo vs. Golovkin will deliver and then some," said Oscar De La Hoya, chairman and CEO of Golden Boy Promotions. "This is a real (sic) fight." That's something that Mayweather and McGregor can't say.